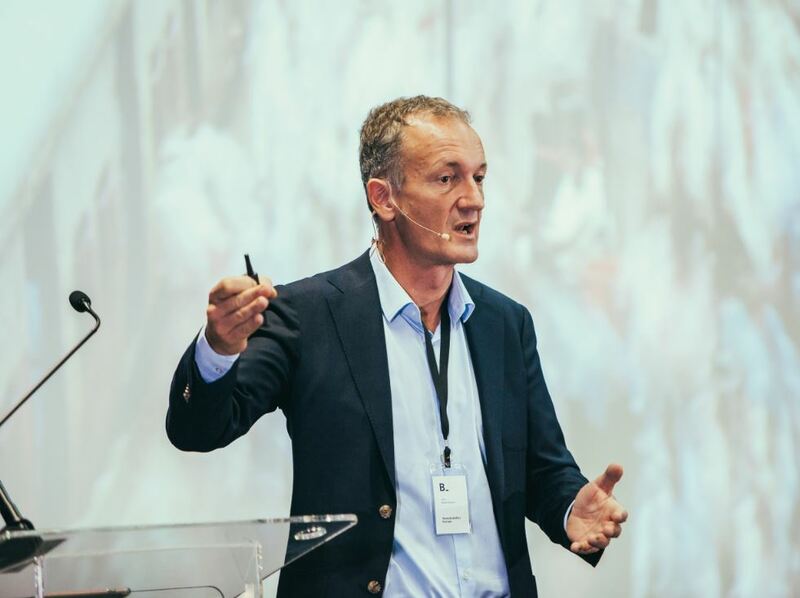 Belgotex recently hosted a sustainability forum in Newtown, Gauteng, where recognised global authority on sustainability and climate change, Steve Howard, gave an inspiring keynote presentation. “The pace of change has never been so fast, and it will never be so slow again. We need to interrogate the future and create new ways to solve the existing challenges that we face,” said Steve. Steve was Chief Sustainability Officer at IKEA Group and served on IKEA’s Executive Group Management from 2011–2017. At IKEA, Steve led the development and implementation of the People and Planet Positive strategy and put in place strategies that led to more than 3 billion euros of investments, from wind power to recycling while at the same time creating a sustainable products category that more than tripled in revenue to a 2-billion-euro business. A champion of equality, Steve supported the rollout of a comprehensive approach on diversity, inclusion and fair pay. In addition to co-chairing We Mean Business, Steve is on the board of SE4ALL and is Co-Chair of the World Economic Forum’s Global Future Council on Environmental and Natural Resource Security. Steve’s leadership has been recognised by Time Magazine who named him a “climate champion”. Steve discussed climate change, technological changes and delved into the deeper intricacies of sustainability. He said that as human beings we have grown accustomed to inventing stories to defend the status quo of how we do things. “We’re comfortable with the status quo, but change is happening all around us right now and we need to embrace it. As industries develop, we have to stop defending old issues and investigate new, completely different ways to solve problems,” said Steve. The world is experiencing an unprecedented rate of change, which is largely driven by the number of people who are now smartphone enabled. The global population is also growing at an unprecedented rate and while large parts of the world still living in poverty, the middle class is rising. “Experts and analysts predict that the middle class of the world will double by 2020 and triple by 2030. This will have a huge impact on industry and businesses. People are coming out of poverty and their quality of life is improving, which is fantastic news because more people will have access to opportunities and better lives,” says Steve. The way that people live and want to live is also vastly different from a few generations ago. If you consider the limitations that our grandparents had compared to what children are exposed to today, it’s not hard to see how lifestyles and goals are changing. “People growing up in today’s world are digital natives – they don’t know life without the internet and technology. The world’s data storage capacity doubles every 18 months and our ability to produce and manage data continues to expand. Nowadays, people do DNA tests on their dogs simply because they can. The sharing economy means that people are sharing everything from car rides and accommodation to household equipment that they aren’t using. The rise of autonomous vehicles and ride-sharing opportunities has vehicle manufacturers in panic mode, but this is only one example of how entire business models will need to change in the future,” says Steve. With everything from machine learning and artificial intelligence to 3D printing and Big Data, humans are now experiencing an existential crisis. In the past, the “American Dream” was seen as a white picket fence and a nice home, but today’s people are much more focused on experiences than ownership. “People no longer aspire to own as much as possible. Aspirations have shifted from physical things to the experiential. Businesses that want to be ready for the future need to tap into these values and needs,” concludes Steve. Sustainability is often only considered when it’s easy, affordable and attractive, but it needs to be a core part of your business, part of your manager’s KPI’s and it needs to be the driving force behind product innovation. These are the words of global authority on sustainability and climate change, Steve Howard, at a Belgotex sustainability forum that was held in Newtown, Johannesburg in November 2017. “Sustainability can’t be seen as a nice-to-have part of your business that operates in isolation from everything else; it has to be connected to everything that you do. It’s no longer just a PR exercise, it needs to be part of your main business agenda for a number of reasons,” says Steve. Climate change is one of the main reasons why companies need to focus on sustainability. The average temperature of the planet used to be 14 degrees, but humans have warmed it to 15 degrees. “We’ve already warmed the planet and this is driving extreme weather events – rainfall, droughts and flooding. We have a window of opportunity to relook the way we manufacture products and use energy,” says Steve. One of the ways to do this is to create space for your staff to innovate and take risks. “Designers love explicit briefs and constraints. When I was working at IKEA, for example, we would ask designers to create a child’s chair that was made out of recycled materials and would only cost four dollars. Setting these kinds of constraints puts designers in innovation mode so that they can come up with out-of-the-box sustainable solutions,” explains Steve. Designers need to be involved in product innovations if businesses want to find new ways to give a second life to their current product range. An example of how this is when Nike started to relook what could be done with the soles of their running shoes. “Nike’s designers found a way to recycle the soles of their shoes so that they could be used as the surfacing on athletic fields. At IKEA, we wanted to find a viable solution for people who wanted to recycle their old sofas. A couch isn’t an easy thing to disassemble, but our product designers came up with a sofa design that could easily be taken apart so that old couches could be recycled. This shows why it’s so important for designers to be part of product and project development from concept to completion. We need to start looking at design from different angles to make sure we’re considering the long-term sustainability of our products,” says Steve. 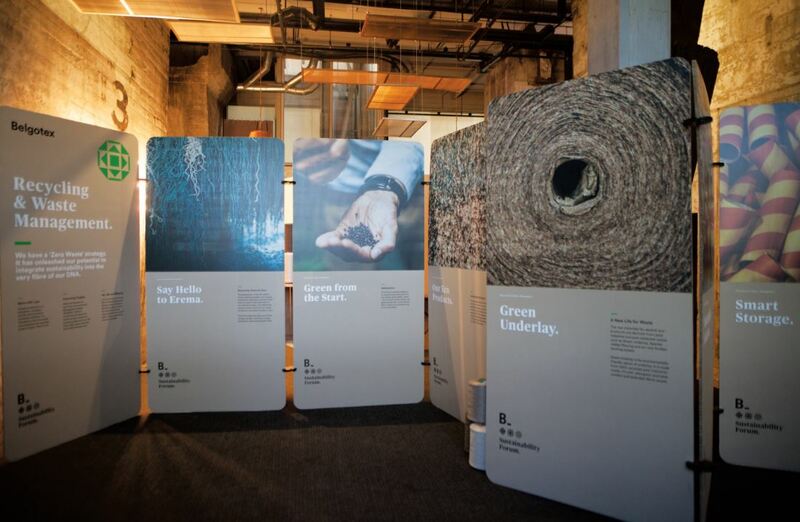 Helen de Villiers, Marketing Manager at Belgotex, says that Steve’s presentation exceeded everyone’s expectations and aligns perfectly with Belgotex’s DNA, which focuses on People, Product and Planet. “Belgotex’s core purpose is to design, manufacture and supply quality products that endure the speed of life. We’ve refocused our strategy to not only supply flooring products, but to focus on being designers first and creating products that are ahead of trends and meet people’s needs as they move throughout their various life phases. What we offer designers is also much more than delivering products, it highlights the experience that we offer. From collaborating and providing samples to sharing information online, Belgotex is focused on the big picture and the long term sustainability of our business,” says Helen. 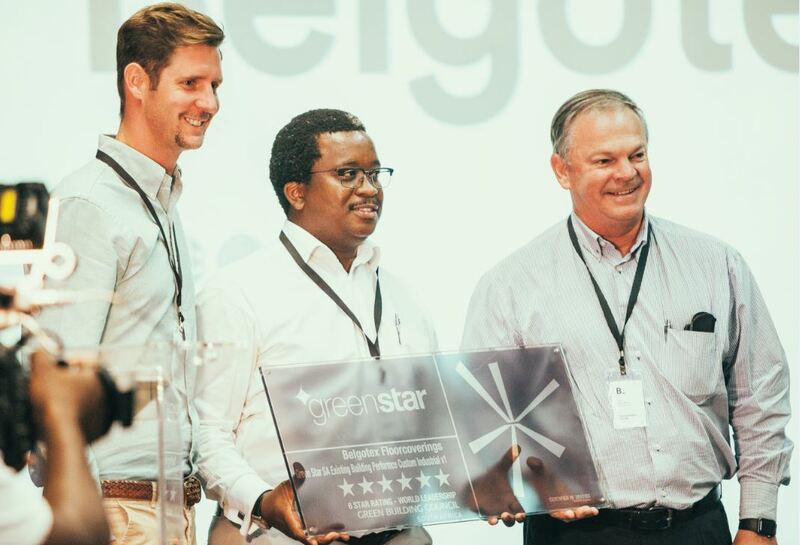 Belgotex Floors is the first South African flooring manufacturer to earn the coveted Global GreenTag eco-label certification, achieving another significant sustainability milestone. Waste management is high on their green agenda. Significant resources and investment have enabled them to reduce material waste rates to almost zero. They’ve gone big on their drive to offset CO2 emissions by investing in solar power resource efficiency and plant upgrades. To discover more about their active efforts to save energy, join them at their green factory exhibition. Embracing change in their traditional manufacturing processes and repurposing harvested rainwater has led to a reduced water consumption of almost 45% since 2015.